As per my Mahindra claasic's dermatologist, my purchase of colorful pharmaceuticals (Paint items) got completed in Pondichery (Really got a good deal). The paint, surface treatment items, anti corrosive itmes, primer, hardner, clear and thiner are the couple of items procured. Except few the important items were from the company ICI and the paint branded 2K. 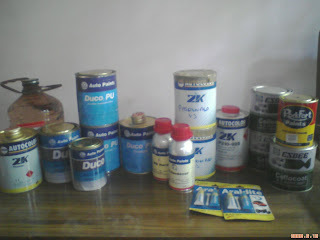 Above are the paints purchased from Pondichery. 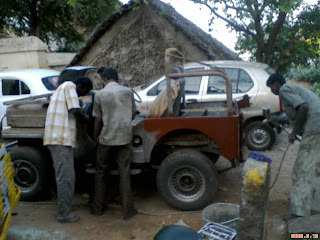 Berger paint's anti corrosive enamel (black)paint and primer will be used for chassis and under body treatment. These 2 items are actually industrial paints, as suggested by a painting expert taking it for my Classic's skin work. You can see from the above picture showcasing medical crew (Painter & Electrician) removing the electricals and applying oil primer to the bare metal body(is to avoid further rusting on the exteriors).